People get their nose pierced to enhance their appearance. The good thing is that nose piercings do help in making an individual look different. However, there are times when these piercings lead to complications. The section below would inform you about some of the most major complications of nose piercing. 1.7.1 Was this article helpful? You can become a victim of infection after getting your nose pierced. Such infections often cause other more serious complications. Infections usually take place when the person piercing your nose is not conscious enough to get each material used during the process sterilized. Sterilization is extremely important as these tools often hold various harmful microorganisms. Examples of disease-causing microorganisms entering human body during nose piercing include Escherichia coli and Pseudomonas aeruginosa. Both these creatures move around freely in our environment and have the habit of settling on surfaces they come in contact with. Here, it must be noted that besides using sterilized tools for piercing, the individual carrying out the process should also sterilize the initial jewelry you would be putting on. You might develop issues due to the jewellery you are wearing. For instance, taking part in strenuous activities can result in loosening and falling of the jewelry into your nostril. What’s even worse is that you may unknowingly end up swallowing the piece when trying to put the loosened stud in place. Swallowing of sharp-ended pieces might require you to undergo a critical surgery (if such pieces are removed at the right time, the consequences might even be fatal). You may also suffer from breathing difficulties if the stud gets stuck inside your windpipe. The situation might turn serious even if the jewelry is not pierced properly. In such situations, the stud may get entangled in your nose causing some really debilitating issues. So, if you feel that the stud has been pierced wrongly, you should get it removed immediately. You must have heard about human body rejecting implants and transplanted organs; similarly, a human body may also reject the jewelry inserted into the nose. If you nose tissue rejects the inserted stud, it would start pushing the piece out gradually. This mostly happens if the stud gets placed wrongly or if it’s much bigger in size than what your nose tissue can handle. Your body might also reject the jewelry if it comes with an off-putting coating. If your skin is allergic to the metal (or any other material) used for crafting the stud, there are high possibilities that your nose tissue would reject the piece. However, the signs of rejection in such cases would be different. Instead of being pushed out, the stud would result in formation of swellings around the pierced area; there will also be noticeable pus formation. The easiest way of preventing any such event is getting your body tested for compatibility with the materials used for crafting the jewelry. If you get the piercing done by an inexperienced individual, he or she might end up damaging delicate nerves of your nose. The situation might turn worse and your nose and its surrounding areas might even lose sensitivity permanently. Improper piercing also often leads to formation of scar tissue. This makes it extremely important that you get the job done only by an experienced and reputable professional. If you develop necrosis, the tissue forming your nose will not be able to tolerate the presence of any kind of prick. The condition would cause the cells around the jewelry to die off. 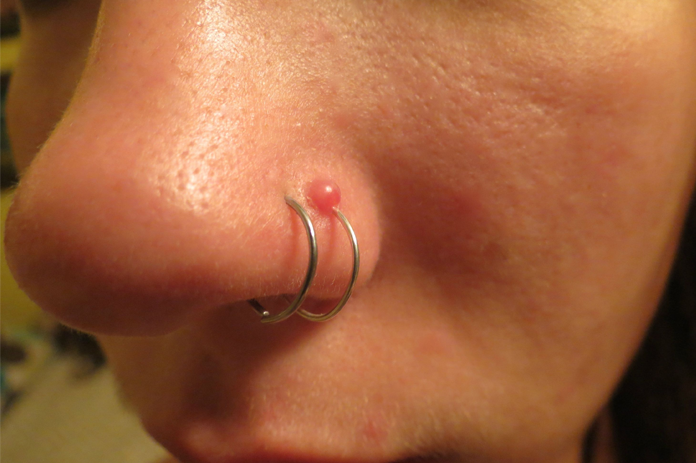 Your chances of developing necrosis would be particularly high if you had a traumatic nose piercing. The condition can also be caused if you are allergic to any material used during the process (mostly when the allergy is not serious enough to cause itching and swelling). You may have a septal hematoma on the nose after getting it exposed any trauma causing activity; however, a wrongly executed nose piercing is possibly the most common cause of the condition. For those who don’t know: the septum is a structure made of cartilage and is responsible for keeping our nostrils separated from each other. This part of the nose doesn’t have any blood supply of its own. If the piercing is traumatic, it can end up injuring the septum. Such injuries often cause bleeding and accumulation of blood in the area between the septum and perichondrium. Some common symptoms of the condition include pain and swelling around the nose and breathing difficulty. The treatment for restoring blood supply to the septum is pretty expensive but is mandatory. That’s because if septal hematoma is not treated promptly and properly, the septum might become non-functional. We started the article saying that people get their nose pierced to look good. However, this often leaves them to ugly scars on their nose. The best way to get rid of a nose piercing scar is by trying out home remedies; visit this page (https://www.ayurhealthtips.com/how-to-get-rid-of-nose-piercing-scar/) to get acquainted with some such amazing remedies. To conclude, we would like to mention that piercing nose should always be done by an expert with years of working experience. That’s actually the only way to avoid all the complications of nose piercing mentioned above.